Kay Catherine real estate began as the mansions of Bellevue Ave took shape and Newport's Kay Catherine area experienced a building boom of its own spearheaded by well-to-do merchants, ship captains, and artists. Members of the local aristocracy employed many of the same architects who designed the mansions including Richard Morris Hunt, Stanford White, and Charles McKim. Kay Catherine real estate consists of lovely Second Empire, Queen Anne, Stick and Shingle Style Victorians on spacious lots with lavish gardens and rare specimen trees. Read more about Kay Catherine real estate or scroll down to view Kay Catherine homes for sale. 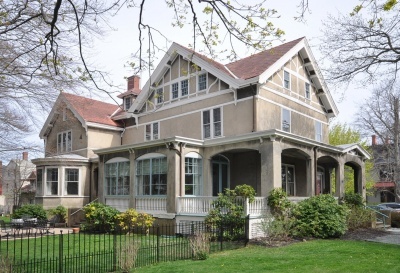 Discover Kay Catherine homes and see where the area was favored by talented artists including renowned landscape painter, William Trost Richards, stained glass artist John LaFarge, painter Thomas Eakins, writers Henry James and Edith Wharton. Today the neighborhood's historic homes coexist comfortably with newer homes offering prospective buyers a wide variety of styles and sizes to choose from. In addition to the stunning architecture, the Kay Catherine neighborhood offers a wonderful location within easy walking distance of downtown Newport, the shops on Bellevue Ave, the Newport Art Museum, First Beach and the historic Redwood Library. The neighborhood is not far from Sachuest Point National Wildlife Refuge, which is well known for its fishing. You can also spearfish from the shoreline. It's a great place for wildlife viewing, hiking, and taking in the breathtaking views. If you enjoy getting out for a round of golf on your time off, check out the Wanumetonomy Golf Club, Newport National Golf Club or the Newport Country Club. To learn more about Kay Catherine real estate, contact us online or call (401) 845-9500 to speak with a Hogan Associates REALTOR® who is familiar with the neighborhoods of Newport.